We now have a connection to the Kaseya Cloud VSA API as a featured integration within BrightGauge so you can create dashboards and reports. 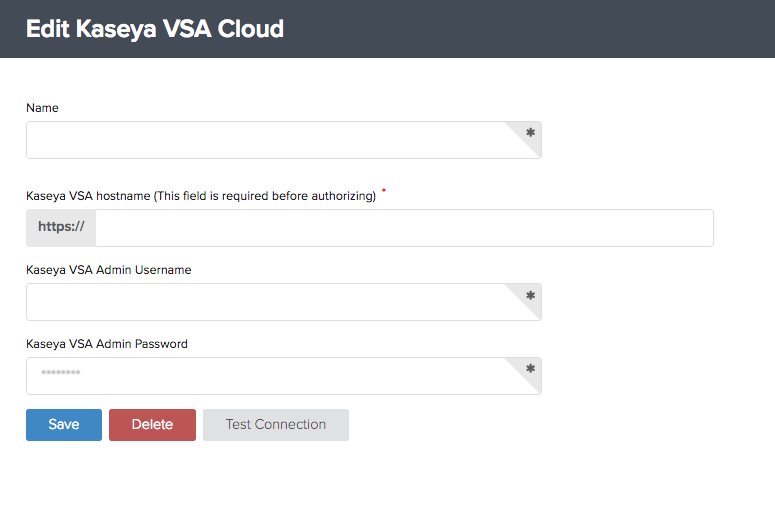 Here is a quick document to help you get set up with BrightGauge and Kaseya Cloud VSA. 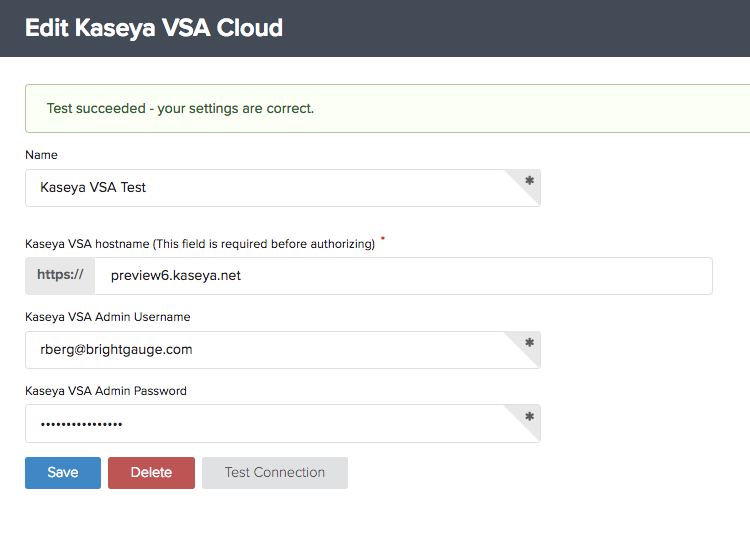 Submit a support request with Kaseya to enable the "API webservice" in your VSA account. We recommend (but do not require) that a separate, dedicated Kaseya user is created for use in BrightGauge. A separate user will ensure the integration continues to function normally when individual user accounts are deactivated or edited. The list of Kaseya users is found under the User heading beneath the System / User Security menu. Click the New button to create a new User. Complete the Add User form to create the new user. Ensure that the new user has the built-in System option selected for Initial Role and Initial Scope. This will provide the BrightGauge account full access to your Kaseya account data. Note: More restrictive roles and scopes may be associated with the BrightGauge Kaseya user, if necessary. For example, a custom Role that provides access to read-only functionality would be appropriate, since BrightGauge does not need any write access to the account. Select the Kaseya user that will be used to pull data into BrightGauge. Ensure the Kaseya user reports System under Last Role and Last Scope. Go to the Overview page (to access click on the BrightGauge logo on the top left-hand corner). You now need to provide the username and password for your Kaseya admin account to provide BrightGauge a way to retrieve data on your behalf. Enter the username and password for the account that will retrieve data from Kaseya. Again, we recommend (but do not require) that a separate, dedicated Kaseya VSA account be created for use with the BrightGauge integration. This should ensure the integration continues to function normally when normal user accounts are deactivated. Important Note: Many password managers and web browsers may auto-populate the username and password fields on this page with your BrightGauge credentials. To avoid authentication problems, fill these credentials in an "incognito" or "private window" with extensions disabled, or very carefully erase the username and password fields every time before clicking either Test Connection or Save. If you have any trouble with authentication, or have any other questions, please reach out to support.